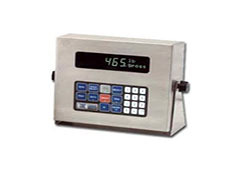 The GSE 660 series weight indicators are fully programmable, for the most advanced weighing applications and process control. The indicators can receive up to eight scale inputs and feature 999 variable data registers and an expandable memory (up to 2M). The programmable digital input and output can control up to seven vibratory feeders and can accept data from flow meters and encoders. 660 Indicators are specifically designed to meet the most demanding applications. Three enclosure configurations and multiple display choices allow you to select the operator interface and controller to best suit your application requirements.